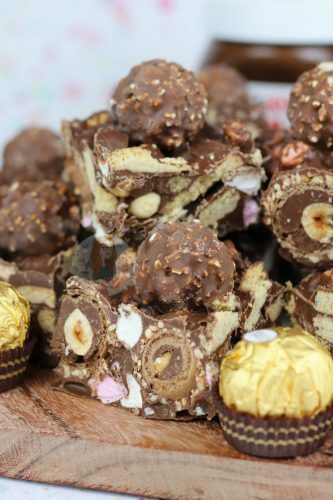 Easy No-Bake Nutella Rocky Road with Ferrero Rocher, Hazelnuts, Digestives, Marshmallows and Nutella! 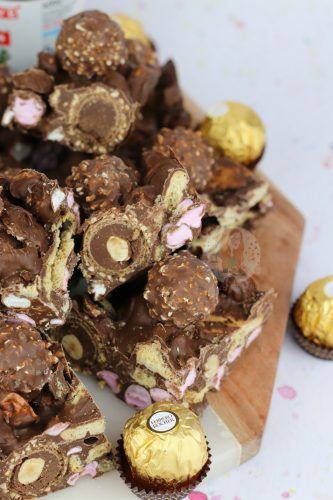 I realise it really wasn’t that long ago that I posted my Kinder Bueno Rocky Road, but I honestly and really couldn’t help posting this Rocky Road as well. It is divine. Similar in a way to my Kinder Bueno Rocky Road, but different enough to warrant a new recipe post of course! I made it quite different in the sense of it has quite a few more ingredients. I went for a Milk Chocolate base, with Nutella and a smidge of butter, just like I do in my Biscoff Rocky Road (but with biscoff of course!). It makes it not completely rock solid like my Kinder Bueno one, but a smudge softer so its easier to cut. For those asking how I cut my Rocky Roads or any traybake’s for that matter, I always use a large 26cm chefs knife so its nice and sharp, and just cut down. If you have a large enough knife, have a solid surface, and the confidence, its a lot easier to cut something without all the awful cracks! But anyway… The Nutella comes through so beautifully where its not completely overpowering, but it makes the chocolate a DELIGHTFUL nutty flavour. The addition of the chopped hazelnuts gives an extra crunch that you will adore, along with the crunchy insides of the Ferrero Rocher. 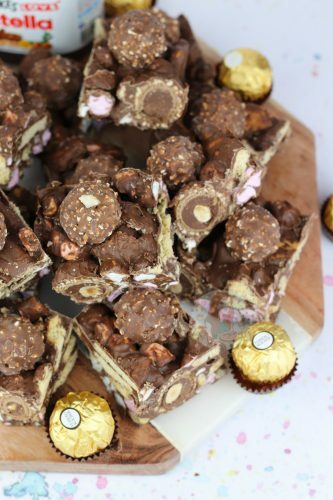 The Ferrero Rocher are optional, but oh my daaaaays they’re lush. 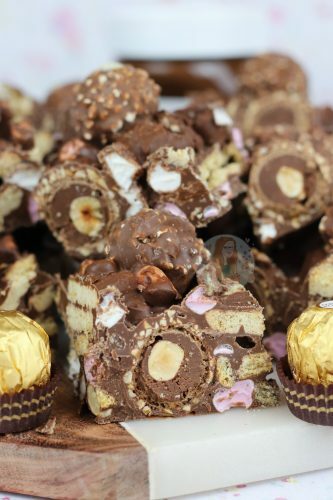 I adore the fact that when you chop into the Rocky Road you can see the innards of the Ferrero Rocher, but it also gives another nutty crunch and delightfulness. Again, they are optional, but damn they’re worth it if you can include them! Just like my Ferrero Rocher & Nutella No-Bake Cheesecake, I simply LOVE THIS RECIPE SO MUCH. Like, can I say that enough?! This is also a No-Bake recipe, so its incredibly easy. Yeah you have to use a few bowls, but imagine licking all those bowls clean! Yummmmmm. I think I am honestly a little addicted to making Rocky Roads, but I simply adore them. A chocolate, a biscuit, marshmallows and a few flavours and you have something easy and delicious to make that anyone enjoys. I obviously get obsessed with them as I have posted quiiiiite a few recipes now, but I know this one is a definite winner. Line a 9" Square Tin with parchment paper and leave to the side. Prep your ingredients. 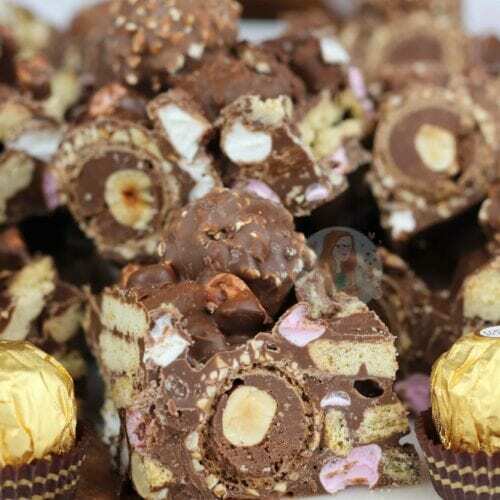 In a large bowl, add your chopped Digestives, hazelnuts and Mini Marshmallows, and the first 16 Ferrero Rocher. In a different large glass bowl over a pan of simmering water, add your Milk Chocolate. Make sure the water doesn't touch the bottom of the bowl, and stir occasionally. 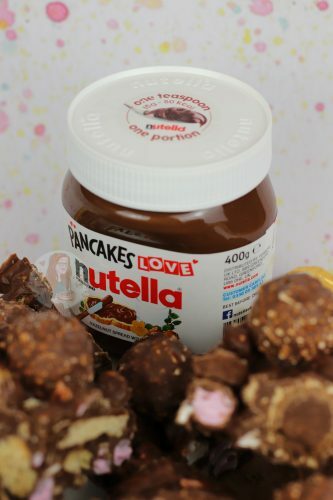 Once melted, add the Nutella and butter to the chocolate and mix together till combined. Once mixed, pour over the dry ingredients and mix everything together carefully. Pour it all into the tin, and make sure its even. Press onto the top another 16 Ferrero Rocher pieces if you want one per piece. Let it set in the fridge for 5-6 hours or more. I used Milk Chocolate for this, but you can easily use dark chocolate as well. 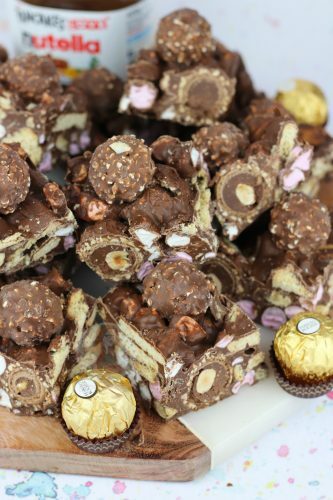 I decided to use Ferrero Rocher in the rocky road, as well as decorating on top. This is because when Ferrero Rocher are on offer, I like to buy a lot.. but I realise its expensive, so its optional. Older Next post: No-Bake Mocha Cheesecake! Newer Previous post: Valentines Macarons! Jane when you say ‘milk chocolate ‘ do you mean cooking chocolate or like Cadbury? Either – both are milk chocolate.